John Ciani was a first-year strolling across the USD campus in the early 1980s when he happened across older students standing around a 350-pound wooden rowing shell. Hanging out at the old quad, the students were recruiting prospective rowers. Ciani turned out to be one of about 100 prospects who attended that meeting. 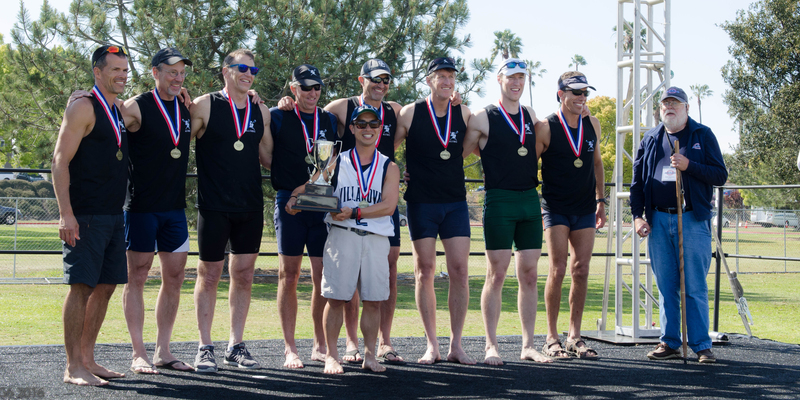 “Only two of us rowed all four years,” recalls Ciani ’85 (BA). More than three decades later, he’s one of an estimated 40 USD alumni who still compete in the sport. The number 40 is significant: This spring, USD rowing celebrated its 40th year. Alumni from the program — comprised of men and women, many of whose college career dates back to the 1980s, along with other, more recent, graduates — have raised more than $40,000 to buy a new eight-seat boat that will be named after former coach Joe Flohr. Ciani, Jaime Bea ’87 (BA) and Mike Weber ’88 (BBA) rowed together at USD. Now in their 50s, they’ve fanned out, geographically, but no matter the distance, the rowing bond remains. All three continue to row and sit in the same boat for masters’ races. “You have to have a bit of an obsessive bone in your body to do something like rowing,” says Weber. “It mentally prepares you for a lot of challenges,” adds Ciani. In November 2011, he was diagnosed with Hodgkin’s lymphoma. He’s in remission after undergoing six months of chemotherapy and says that rowing has helped him battle the disease. “The amount of training that goes into rowing for very little reward gives you that mindset of just getting through, being able to persevere,” he says.